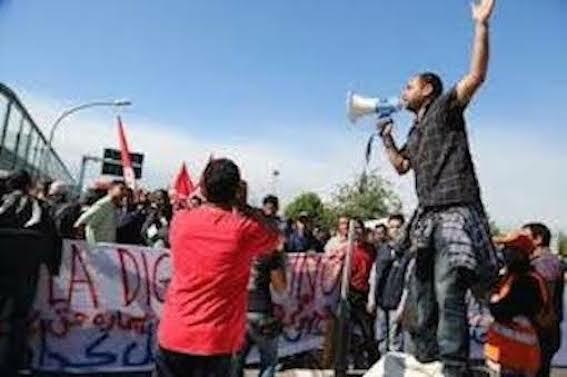 On January 8, at the Bormioli warehouse in Fidenza, the riot police dismantled the “presidio”  set up by the warehouse workers belonging to Si.Cobas and their supporters, against the new contract agreement signed between the company, the CGIL, CISL unions and the cooperative CAL established by Bormioli, which runs the logistics business of the company. In many different ways this agreement means conditions will only get worse. Once again, the warehouse workers who, in terms of class struggle are one of the few sectors showing some sign of life, were attacked along with their supporters by the forces of bourgeois order, dragged to the police station and cautioned. It is yet another confirmation that at this stage of the deep crisis of capitalism, the bosses cannot tolerate any movement by the class. Unfortunately however this is in a numerically small section of the class and the struggle is only at a union or defensive level. This therefore allows the state to use the full power of its machinery to crush any sign of struggle that might hold up the production process, namely the exploitation of the workforce. It is an exploitation which has to be increased to cope with the increasingly fierce competition between capitals. It is also further confirmation that in times of crisis the incompatibility between the interests of the proletariat and the bourgeoisie becomes more acute: there is no room for "agreements" i.e. for accepting an allegedly lesser evil that makes the living and working conditions of the working class more "bearable". Not surprisingly, employers and governments want to radically "reform" the system of bargaining, to the bosses’ benefit, of course. These "small" incidents of repression — a similar incident also happened in Desenzano del Garda — are intended to be a warning against the dreaded revival of more episodes of class struggle. The forces of the bourgeoisie proper were later joined by the big union federations who even organised a rally of Bormioli workers against the warehouse workers. We would say that the unions behaved shamefully here, if we did not know that it is their role to control the workforce at all times, to prevent its struggles from bypassing or threatening to go beyond what capitalism can tolerate and, when needed, to incite one set of workers against another! To the workers in struggle and those who, in support them and suffered the inevitable repression of bourgeois justice we extend our solidarity. At the same time, we cannot avoid stressing that the road of trade unionism, even when it tries to be more radical, is a road that leads nowhere, especially today. Trades unionism , by its nature, cannot help but respect the rules of the capitalist economy, at all times; more so when the crisis inexorably and progressively demands acceptance of an even lower level of living standards. It is no coincidence that the few struggles that do emerge, even the most active and determined, are generally defensive ones to resist the increased weight of the attacks of the class enemy (plant closures, and layoffs, particularly of politically active workers like those in the warehouses). This does not mean that the class should not fight for its immediate needs! On the contrary, if you do not fight to defend your immediate interests, you will never have the capacity to fight for more general and long-term objectives. But the struggle has to go beyond trade union rituals — where the search for mediation with bourgeois institutions is a basic standard practice — it must strive to push beyond the boundaries of one company or a single sector. This though is not an easy task, given the current lack of response of the working class and the void (or almost) in which the struggles of the warehouse workers are taking place. Going beyond (and, if necessary, against) trade unionism is a necessary (but not sufficient) condition for starting to develop a perspective of overthrowing this society based on exploitation, a perspective that can only be found in a revolutionary party. The revival of the communist programme for the revolutionary conquest of power is essential. Circulating it in the class will strengthen the work of creating the party, the only real tool to fight the bosses’ violence and scrap the capitalist system once and for all. Solidarity with the warehouse workers, for the overthrow of capitalism! See “Italy: Solidarity with the Workers of Bormioli di Fidenza” on our website. This is an update.